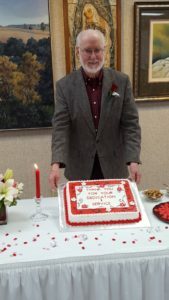 Dr. Gary Hulett was recognized at a luncheon held in his honor on February 19. Hulett retired from the Dane G. Hansen Foundation Scholarship Committee this spring after 13 years of service. The event was held at the Dane G. Hansen Plaza in Logan, Kansas. Hulett makes his home in Hays and is a retired professor of biology at Ft. Hays State University where he taught for 36 years. He has lived in Australia, Canada, Great Britain and Egypt. His varied experiences were all connected by his love of working with young people. He and his wife, Ila who is a chemist, still use the recreation facility at Ft. Hays because they enjoy being around the students. Over his 13 years of service on the committee, Hulett estimates he has interviewed more than 2800 students. Learning what they aspire to be is one of the things he loved about the process. Another memory was the time that a scholarship committee member asked a student if he had any questions. The student asked “Why are we here?” as in the existential sense. The committee enjoyed that. Cy Moyer, president of the Dane G. Hansen Foundation Board of Trustees credited Hulett and the scholarship committee for the success of the Hansen Scholarship program. Moyer noted that it was hard to go anywhere in Northwest Kansas and not run into a Hansen scholar. Hulett shared that he had seen many changes while on the selection committee, including technology. He thanked the Hansen Trustees for their leadership, and shared that he had particularly fond memories of working with Doyle Rahjes, the trustee that invited him to serve on the committee and worked closely with the scholarship program until his passing last year. He said he will miss the committee and the conversations, but mostly the students, whom he called impressive. Ward Cassidy, retired educator from St. Francis, Kansas will take Hulett’s place on the committee. Like Hulett, he has years of experience with, and a love for working with young people. He spent 34 years as a teacher, coach, counselor and principal. He has also served as a state legislator.